NEW YORK—In an effort to emphasize the value of its offerings and enhance the visibility of its brand, electronics superstore TV America will run a new commercial that features former tennis great John McEnroe intoning his trademark phrase "You cannot be serious," company representatives announced Friday. "Our idea was to show the agitation and frustration we believe customers feel toward the high prices of our competitors, as well as the stark disbelief they may experience when confronted with the great values and high level of customer service encountered at any TV America location," said Edward Bernsen, the retail chain's marketing director. "We also wanted to use the image of a highly recognizable figure from the world of sports, as sporting events figure prominently in our customers' television-viewing habits. Clearly, McEnroe and his trademark phrase were the first things that came to mind." "Not only is hearing John McEnroe say 'You cannot be serious' in a context outside of tennis a unique and original idea," Bernsen added, "but it will also be humorous because of how angry he'll be. We're very excited for this campaign." In the 30-second spot, McEnroe—who is dressed in casual tennis apparel and carries a racket despite the fact that he is ostensibly shopping for home electronics—is browsing inside the thinly disguised, but still recognizable store of a TV America competitor. Upon seeing the prices said competitor is asking for many popular name-brand electronics, the three-time Wimbledon winner utters the phrase "You cannot be serious!" and proceeds to ask nearby sales representatives if they are aware of the heavily discounted prices at local TV America stores. Upon being told that yes, they are aware of TV America's low, low prices but are unable to match them, an incredulous McEnroe speaks the line "You cannot be serious!" once more. After a brief interlude, during which a TV America saleswoman details the store's superior prices, convenient locations, and high level of product support, McEnroe is shown shopping at a clean and well-lit TV America location. Upon seeing its much lower prices on the same popular name brands, McEnroe looks at the saleswoman, who is inexplicably seated in a tennis umpire's chair, and says to her, "You cannot be serious!" bringing the total number of times he says "You cannot be serious!" to three. Upon being assured by the nodding saleswoman that yes, she is very serious indeed with regard to TV America's price, value, and overall shopping experience, McEnroe is visibly mollified. "We were looking for someone who signifies the high level of quality one finds every day at TV America stores from coast-to-coast and who also demands that quality from others—a 'tough customer,' if you will, whom audiences would identify as someone who questions the judgment and dedication of those who just don't measure up," Bernsen said. "A spokesman synonymous with frustration, who could easily embody the aggravated state customers often find themselves in when navigating the world of contemporary retail shopping, seemed ideal. When we hit on the idea of John McEnroe, with his penchant for saying 'You cannot be serious,' we knew it was a perfect fit." Representatives for TV America then contacted McEnroe, who agreed to the commercial almost instantly. As the ad campaign continues, McEnroe will reportedly be seen in several different electronics-shopping situations, including scenarios in which he accepts home delivery of a large flat-screen television, has a surround-sound system installed in his living room, and attempts to return an overpriced and underperforming item to another TV America competitor. 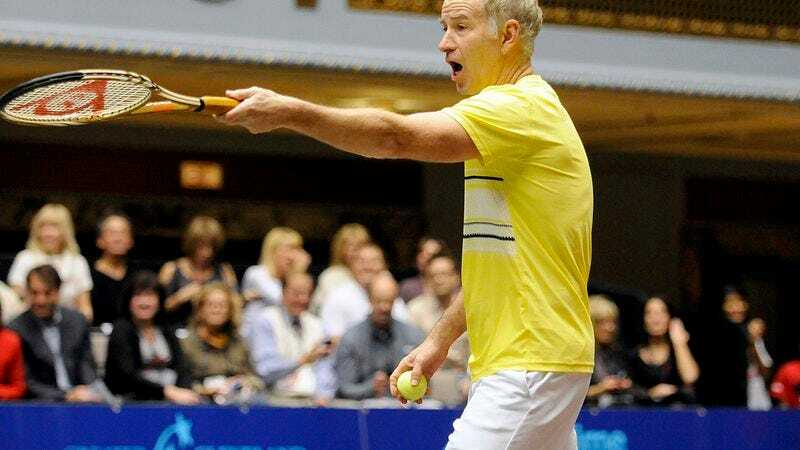 In each case, McEnroe will intone the words "You cannot be serious!" with an appropriate degree of either happiness or disgust, as the situation warrants. "It's a funny switch when he says 'You cannot be serious' in more of a surprised, happy way, because for the most part people expect him to say it angrily," Bernsen said. "We're thinking that maybe, in future spots, he might start the phrase by saying 'You cannot…' and then we can have one of our sales representatives cut him off and say 'be serious?'" "Our advertising team is very smart and creative," Bernsen continued. McEnroe first yelled the phrase "You cannot be serious" during his 1981 Wimbledon match against Tom Gullikson. He has been heard saying it 7,854,322 times since.